We would like to invite our fans to the last in this year Open Day in Skieniewice Engine Shed on 4th October. As always, feel free to visit our rolling stock collection, the old railway workshop and smithy and the interactive exhibition of railway signaling and traffic safety devices. Catering will be provided by Atmosfera pizza house. 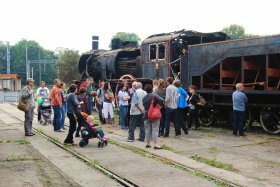 We also encourage you to visit the new exhibition of photographs from “Railway in lens” competition.